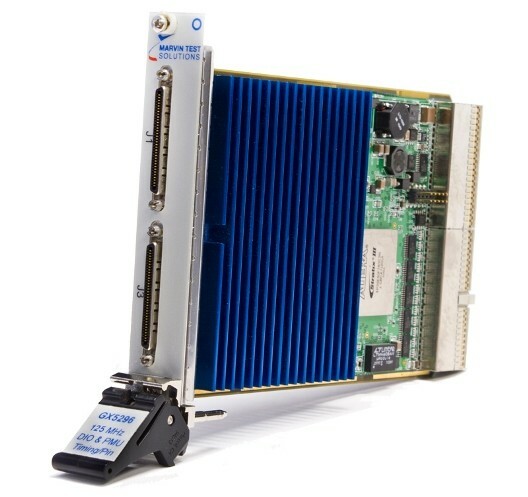 Produktinformationen "Marvin Test Solutions: MV-GX5296: Dynamic Digital I/O with per Channel Timing, Programmable Logic Le"
The Marvin Test MV-GX5296 offers the most performance and features of any 3U PXI dynamic digital I/O board on the market today. The 32-channel, MV-GX5296 offers timing per pin, multiple time sets, data formatting, and an advanced sequencer - providing users with the capability to emulate and test complex digital busses for system, board or device test applications. Offering 1 ns edge placement resolution per pin and a PMU per pin, the MV-GX5296 has the ability to perform both DC and AC parametric testing. Each digital channel can be individually programmed for a drive hi, drive lo, sense hi, sense lo, and load value (with commutation voltage level). In addition, each channel offers a parametric measurement unit (PMU) providing users with the capability to perform parallel DC measurements on the DUT (device under test). The Marvin Test MV-GX5296 supports deep pattern memory by offering 64 Mb per pin of vector memory with dynamic per pin direction control and with test rates up to 125 MHz. The board supports both Stimulus / Response and Real-time Compare modes of operation, allowing the user to maximize test throughput for go / no-go testing of components and UUTs that require deep memory test patterns. The single board design supports both master and slave functionality without the use of add-on modules. The MV-GX5296’s timing generator supports 4 timing phases and windows (drive and sense timing). Each phase and window is comprised of two timing edges - assert / de-assert and an open window / close window respectively. Timing resolution of 1ns is supported for each of these edges. Four time sets are available for mapping edge timing to each channel. Up to 64 unique time set combinations can be defined. Additionally, six data formats are supported - NR (no return), R0, R1, RHiZ, and RC (Return to Complement), RSC (Return Surround with Complement). Pin electronic resources are independent on a per channel basis and include a full-featured PMU for DC characterization of DUTs. The PMU can operate in the force voltage / measure current or force current / measure voltage mode. Additionally, 4 additional pin electronics resources are available for use as timing and/or control resources - providing programmable drive and sense levels from -2 to +7 volts. The MV-GX5296 employs a PLL based, clock system which offers programmable vector clock rates up to 125 MHz. In addition, a clocks per pattern (CPP) divider is available, providing additional clocking and edge placement flexibility. External input and output synchronization signals are also supported, providing the ability to synchronize the Marvin Test MV-GX5296 to external events or time bases. The MV-GX5296’s offers a full-featured sequencer. Capabilities include conditional jump, unconditional jump, subroutine jump, or looping (with nested loops). Additionally, the sequencer has the ability to handshake with various signals in order to synchronize with a UUT. Handshaking settings can be selected on a per Step basis where various Handshake Pause and Resume resources can be used. Total sequencer memory size is 4096 steps. Weiterführende Links zu "Marvin Test Solutions: MV-GX5296: Dynamic Digital I/O with per Channel Timing, Programmable Logic Le"